Title: "Namor unchained!" / "Comes the Piranha!" 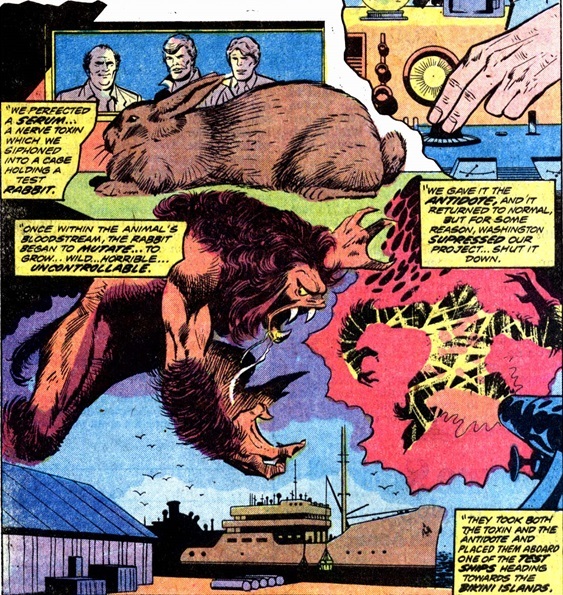 Marv Wolfman takes over for Steve Gerber on these penultimate Sub-Mariner issues and delivers a story that is actually pretty cool but is totally undermined by George Tuska's art - and a basic biological problem. 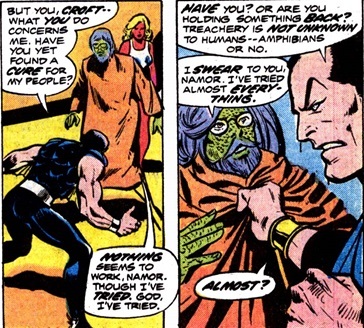 Namor is in a complete rage about the Atlanteans getting put in their coma, and he's blaming all of humanity for it. 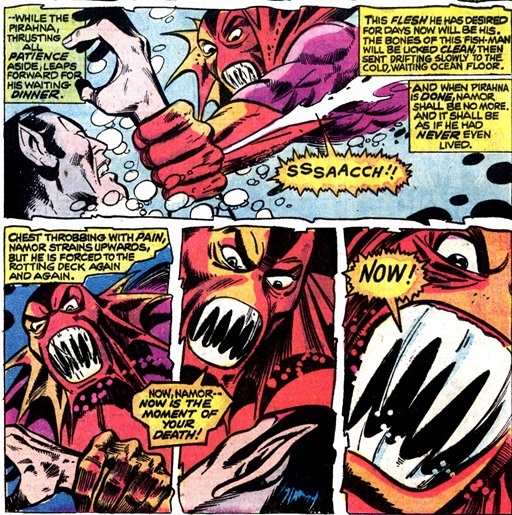 The fact that it was actually an extra-dimensional monster that triggered the battle that exposed his people to the nerve gas, and the fact that humans have recently provided Namor with the suit that allows him to breathe air and the forcefield that preserves Atlantis, and that another (former) human, Henry Croft, is working on a cure for the Atlanteans, doesn't seem to factor into it, but it's Namor and we shouldn't really expect rationality from him. Anyway, Croft thinks that he knows where a possible cure might be. ...and the cure for that serum may help the Atlanteans. But both the serum and the antidote were inexplicably put on a boat that was sent to be a dummy target for nuclear testing at the Bikini islands. So Namor heads there to find the vials. No one mentions the possibility that the vials might have been contaminated from the nuclear blast, but it's ok because the vials will turn out to be useless. ...that turn out to be led by the incredibly goofy looking Piranha. 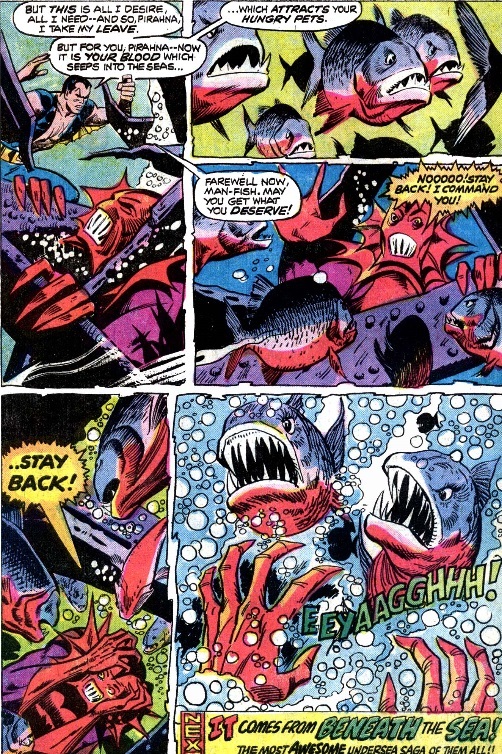 In addition to be able to mutate regular fish into Men-Fish, the Piranha has the ability to control other piranhas, and, strangely, sharks. No one questions what piranhas, native to freshwater South American rivers, are doing in the Pacific Ocean. 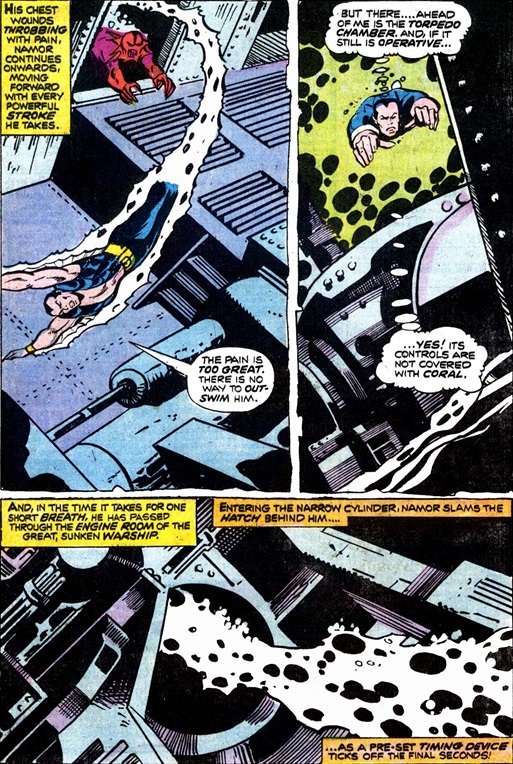 ...and since Namor is really just trying to bring the vials back to Hydrobase, he comes up with the awesome idea of trying to flee by launching himself through a torpedo tube. 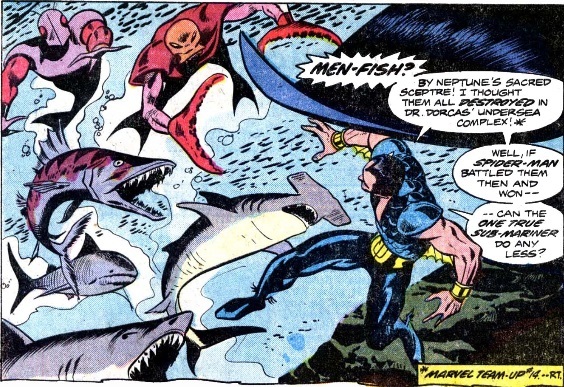 It's to no avail, however, and eventually Namor and the Piranha have to duke it out. 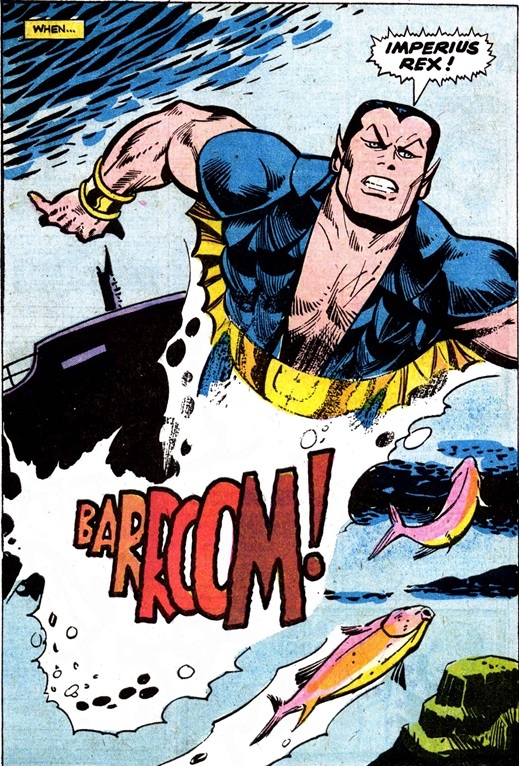 The story ends with Namor injuring the Piranha enough that he's eaten by his own pets. As with recent issues of Daredevil, it's admitted in the lettercol that Gerber's run hasn't been great, and he was trying to turn things around. But obviously he's off the book at this point, and the series is cancelled after next issue. Chronological Placement Considerations: It's said to have been "a week" since Namor last was on Hydrobase, but he won't say where he's been. The MCP places this before Defenders #13. It's said that Namorita will return to school after her appearance here; that happens in Marvel Two-In-One #4. 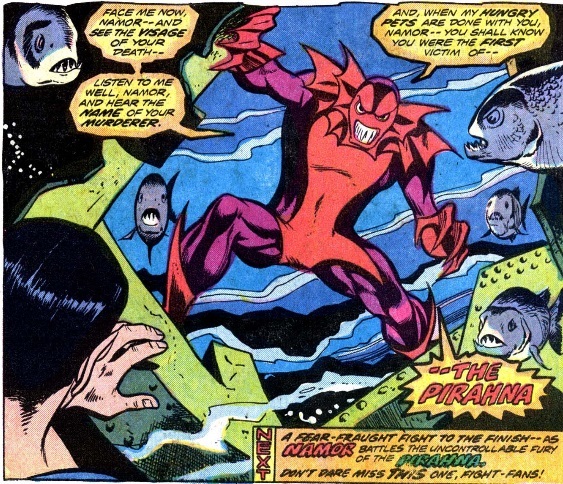 The Men-Fish previously appeared in Marvel Team-Up #14. Piranha is just so darn cute. This series really needed to be canceled. They did nothing but make a total mess of it after Everett died. 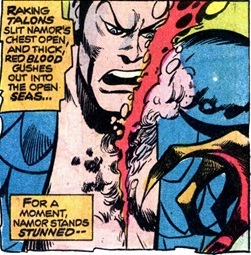 Not the least of the problems is Namor's ridiculous swimming suit, which unfortunately sticks around for years to come. Namor is a difficult character to get right. Trying to force it to keep happening in the absence of a clear guiding vision was a huge mistake.